Like most people, we take our dogs for car rides… a lot! We have for years. 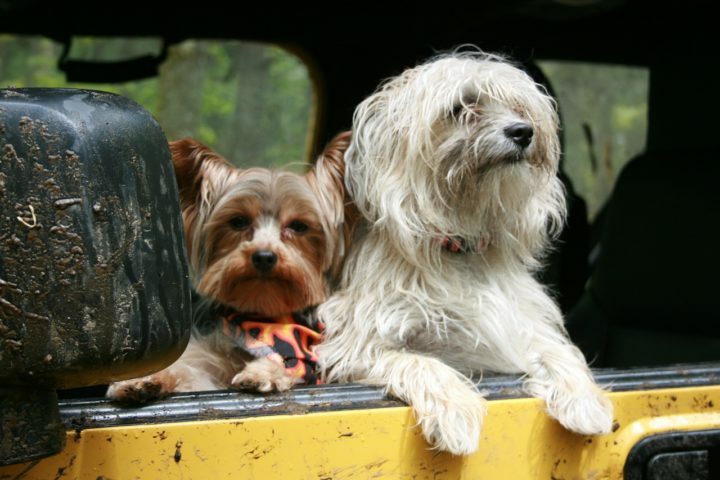 Then, when Jim & I purchased our first Jeep Wrangler several years ago, we then started taking our dogs on Jeep rides (…instead of car rides). Here’s what we’ve learned, firsthand, about dogs riding in cars — particularly, the safest way to travel with your dog in a car or a Jeep. Make sure your dog can’t jump (or fall) out of the window. 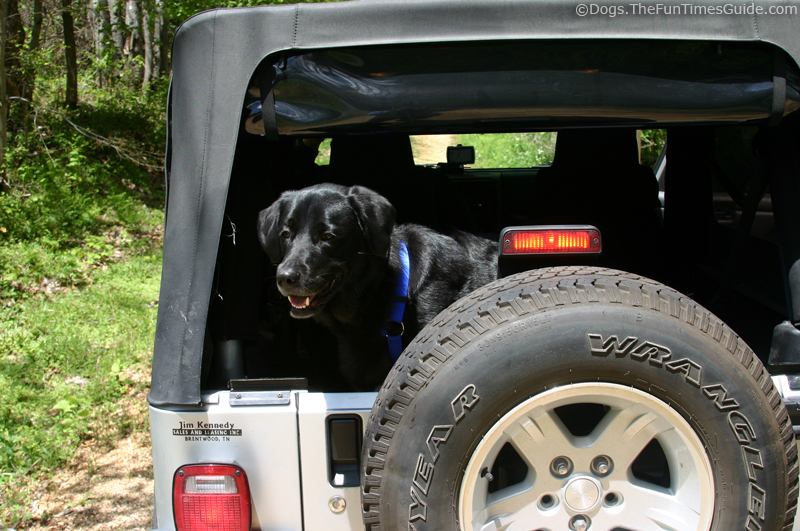 Make sure your dog can’t roam around too much inside the vehicle (…see below). First and foremost… dogs can fall out of the car window. Yep, while your car is moving. And even if the window is mostly rolled up! Second, lots of people don’t want to secure their dog in place when riding in a car. They think it takes the fun out of it for the dog. Trust me, it doesn’t — especially if you start using a doggie seatbelt & harness (similar to the ones mentioned below) when your dog is still a puppy. We didn’t always secure our dogs in the back seat, but I can tell you that our car rides became much more enjoyable — for all involved — the day we started doing it. Third, many dog owners like to try lots of fun new gadgets that are dog-friendly. That was how we came to love the dog window chin rest called Comfort Cruiser. It was relatively inexpensive, and seemed to serve a purpose: to cushion your dog’s chin while resting his head part-way out the car window. 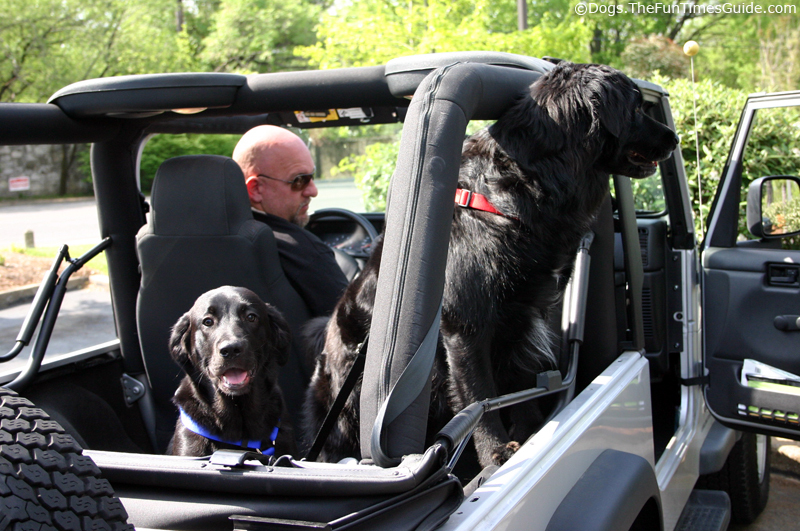 When we had 2 dogs, we took them both for occasional car rides in the back of our Jeep Wrangler. 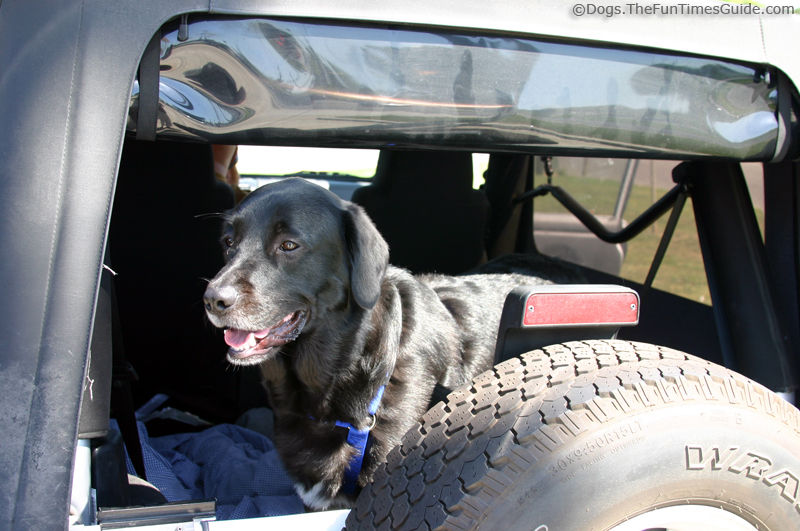 Destin was our first Jeep dog. Now that we only have 1 dog, we do it practically every day. Tenor is our current Jeep dog. 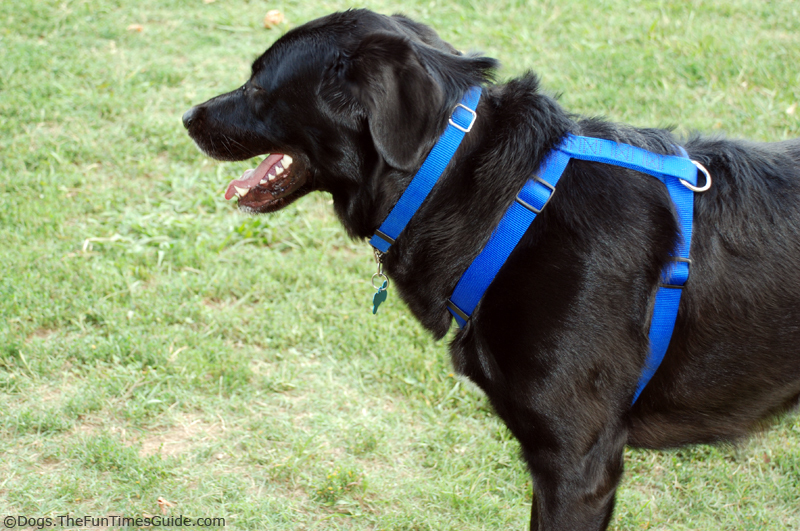 #1 – The dog wears a standard chest-harness (goes over his head and around his front lets & attached closed around his chest). You can buy a dog harness that’s specifically made for use in cars, but you don’t need to. There is a metal ring on most standard dog harnesses (that rests on top of their back) that can be used to secure your dog inside the vehicle. 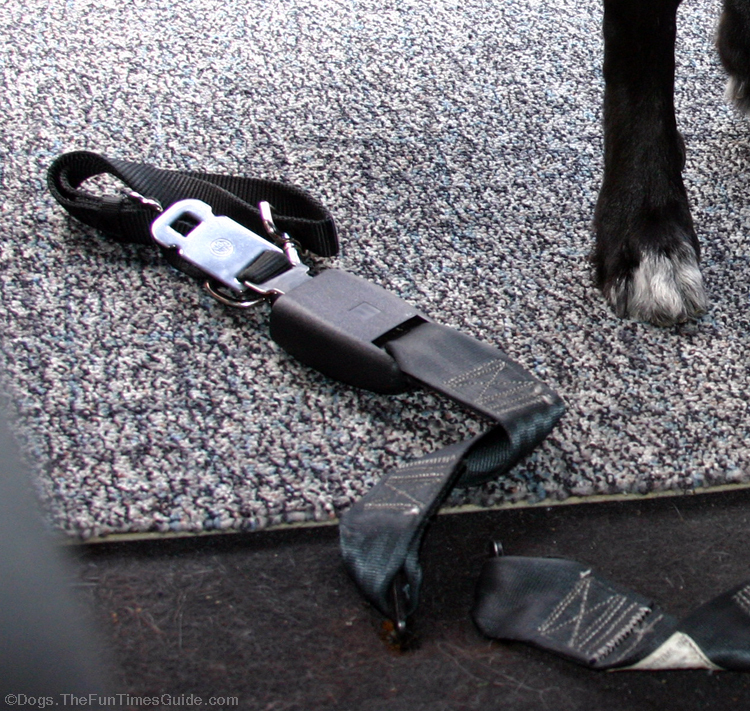 #2 – Use a dog seatbelt adapter that clips into your standard car seatbelt on one end & your dog’s harness on the other. 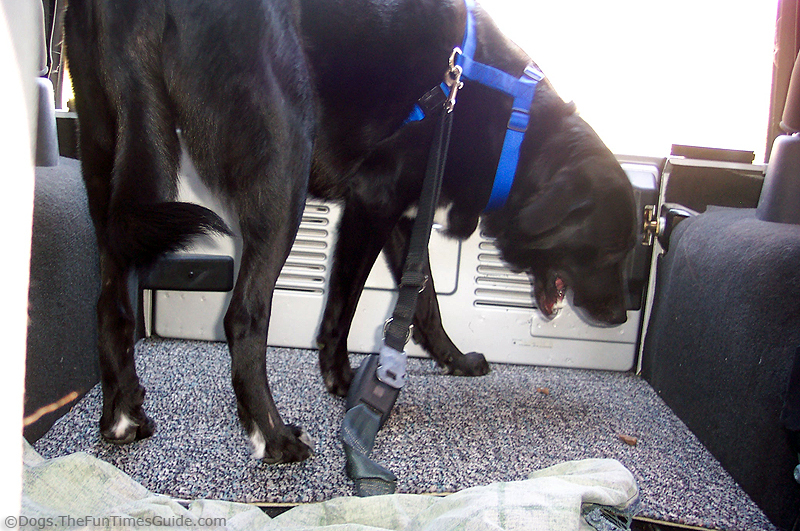 The seatbelt adapter can be lengthened or shortened to give your dog “more room to roam” or “less room to roam”. We make it so he can just barely stick his head out the very back window/doorway of the Jeep Wrangler. They sell complete dog travel systems that include both the harness and the seatbelt adapter as well. Petbuckle is one of them. The dog harness “centers” his weight and makes it less likely that he’ll be propelled out (during a turn, for example). And the adjustable seatbelt adapter dictates just how far he can extend his head beyond the back of the Jeep. JEEP BONUS TIP: The 2 lower corners of the Jeep window/doorway area (where the metal jeep rail protrudes a bit in order to secure the bottom of the vinyl Jeep window) aren’t really sharp enough to hurt your dog, but they do stick out enough to catch a dog collar — IF worn at the same time as the dog harness in the back of the Jeep. So we decided to take off the dog collar each time we put the dog harness on for Jeep rides. 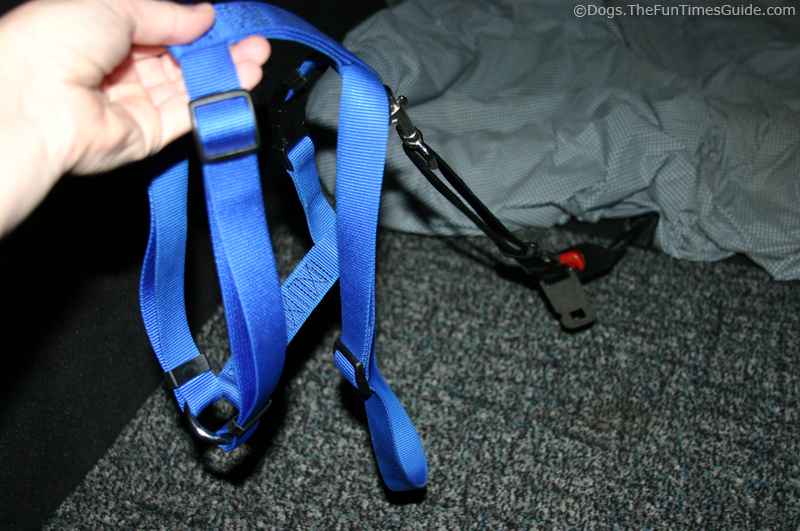 Eventually, we switched to a nylon dog collar with a plastic buckle instead of the chain part. Here are the things I always take along whenever we’re out & about with our dog.